This week, Your News to Know rounds up the latest news stories involving gold and the overall economy. Stories include: ETF manager renounces emerging markets and piles into gold, silver has potential for a 50% rally, and a gold coin thought to be fake turns out to be worth millions. Despite making their name on emerging-market funds, a Boston-based asset management firm says it’s time to move into gold. Fritz Folts, chief investment strategist and managing partner at 3EDGE Asset Management, spoke to Bloomberg about an upcoming shift from riskier assets towards the safety of precious metals, stating that the change is already underway. Folts sees a loss of investor confidence and timid growth as key indicators that the stellar last year in equities is behind us. Jitters in the stock market and fears over global trade tensions will continue driving interest into gold. The metal has already gained 1% over the past month amid tariff woes between the U.S. on one side and China and the European Union on the other. Besides slashing his holdings of stock-backed ETFs and completely moving out of emerging market funds, the money manager is also bearish on bonds given the Fed’s hawkish policy. With so many markets slated for a downturn, Folts stressed that gold is the best place to be in right now. He added that the metal remains the best possible protection against volatility, of which we are bound to see more of in 2018. The latest report by Bloomberg Intelligence predicts a sharp rise in both gold and silver due to increasingly favorable market conditions. These include a weakening of the dollar, a spike in inflation and the return of volatility to the stock market. Of the two precious metals, silver could see a more significant increase, with prices potentially climbing 50%. As seen on Kitco, the gold/silver ratio continues to widen, having reached a historic high of 82 after gold closed 2017 with a 9% gain. Meanwhile, silver has remained virtually unchanged since June 2016, suggesting that the metal has a lot of catching up to do. Mike McGlone, a senior analyst at Bloomberg Intelligence, pointed out that silver’s 12-month range hasn’t been this narrow in around 50 years, increasing the likelihood that it will break out in the near future. The analysis also forecasted more losses for the dollar, both over the short and long terms. Although it saw a brief recovery at the beginning of the week, the greenback maintains a downward trajectory which started in early 2017. “Despite the Federal Reserve’s accelerated rate-hike schedule, the dollar declined. Down remains its longer-term path of least resistance,” said the report. 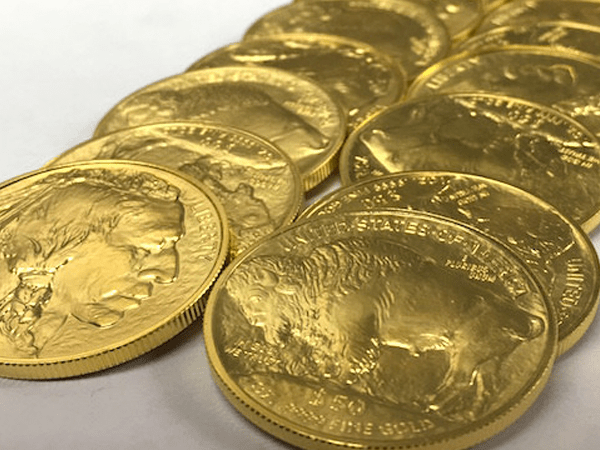 In 1854, the San Francisco Mint produced a little under 300 $5 gold coins to commemorate the California Gold Rush. Until recently, only three coins from this collection were accounted for, each with a well-documented lineage and each worth millions of dollars, via Gizmodo. Now, a fourth coin from the set has been confirmed to exist, belonging to an anonymous owner from New England. Due to its rarity, the owner had trouble verifying the coin, as regular sellers were convinced that it must be a forgery. The collector then sought the help of the Numismatic Guaranty Corporation, a Florida-based company that specializes in the authentication of rare and valuable coins. After extensive research, which included obtaining high-resolution images from the Smithsonian Museum where another coin from the same collection is held, NGC told the owner that his precious possession was genuine. The company also had to make sure that the 1854 gold coin wasn’t the same piece that was taken from the Du Pont family during a home invasion in 1967. And although NGC confirmed that the New England coin was indeed a different entity, the firm declined to share details on how it was obtained, likely at the behest of the owner’s wishes. The numismatic company did reveal that the coin is immensely rare and, while withholding an official valuation, affirmed that the coin is worth millions.